AJs MOO pizza, straight from the oven, piping hot and ready to eat! Thursday night is MOO pizza night in our house. We make pizza the old fashioned way, with a yeast dough and homemade tomato sauce, lots of freshly grated cheese and whatever other toppings we can find. Then we bake them on baking sheets or the pizza stones in the oven. Twenty minutes at 160 degrees Celsius and we have the best gourmet pizza around. So why, when MOOing pizza is so easy, would you even want to spend $140+ dollars on an electric appliance that bakes just one pizza at a time (I can get four in my oven or on the barbecue). It sounds great. The stone absorbs moisture the pizza releases during baking to ensure a nice crisp, evenly cooked base. It can cook a pizza in as little as five minutes. It is (supposedly - I've never used one so I can't really say either way) easy to clean. And it takes up a LOT of room in the kitchen whether it's on the bench or in a cupboard. I'm just saying I can buy a whole lot of pizza ingredients for $140, keep what little spare space I have in the kitchen and still turn out fantastic pizzas. 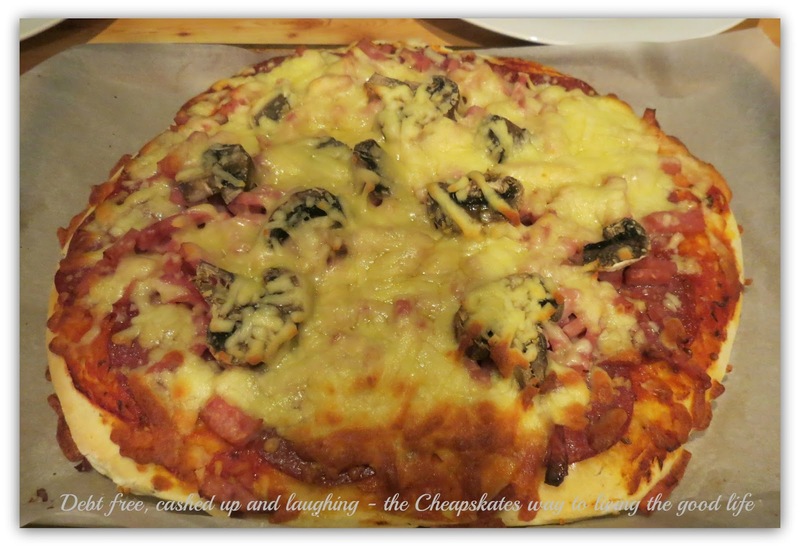 I use the Penny Pinching Pizza recipe for the bases because it is so quick and easy. When I make pizza bases I quadruple the recipe, giving me enough pizza dough for 8 pizzas - enough for a month of MOO pizza nights. First you dissolve the sugar in warm water then add the yeast and let it get all bubbly and frothy. 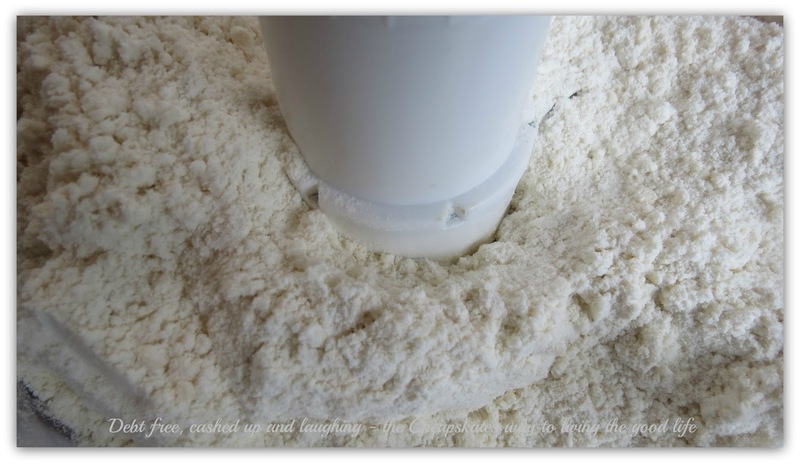 While the yeast it doing its thing, process the flour with the oil until it looks like breadcrumbs. Using a food processor makes this step a breeze. 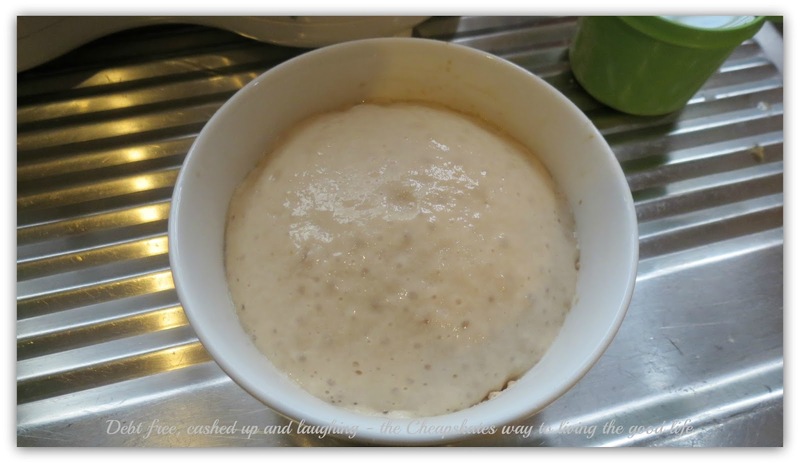 When the flour is all crumbly add the yeast mixture and give it a whizz for a couple of seconds to blend it. Then slowly pour in the remaining water. Let that food processor work its magic and turn that floury mess into a glorious blob of soft, smooth pizza dough. Turn it out onto a floured bread board, cover it with a damp tea towel and let that hard-working dough have a rest for about 10 minutes. When the dough is rested and ready to become a tasty pizza cut it in half. Then press it, don't roll it, to fit your pizza tray. Add your toppings, put it into the oven and in 20 minutes you'll be enjoying the best pizza you've ever had. 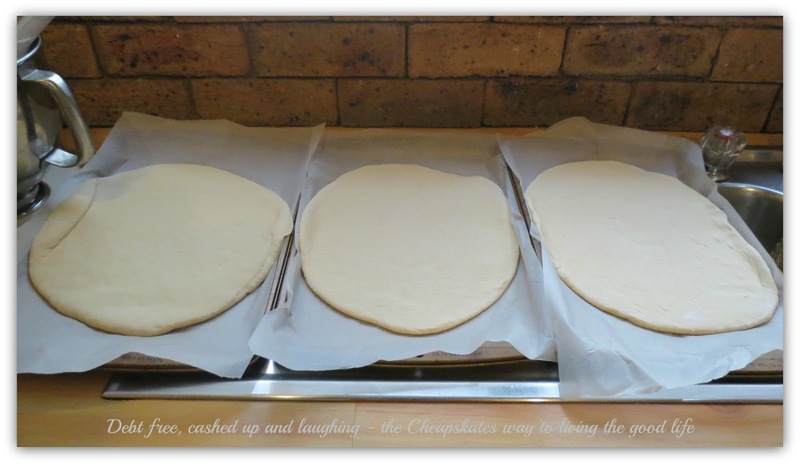 I call these our rustic range - I don't have any round trays so we make the "round" pizza bases fit the oblong baking sheets. Toppings are tomato sauce (I use homemade from tomato paste) and cheese and then either olives, onion, sliced tomato, ham, salami, chicken, capsicum, mushrooms, pineapple, feta, mozzarella, baby spinach - whatever is in the fridge really. A couple of weeks ago Tineka suggested using cooked chicken with a drizzle of kecap manis over the top, then a sprinkle of grated mozzarella for a satay-style pizza. Sounds odd with the kecap manis but trust me. It. Is. Finger. Licking. Lip. Smackingly. Good. Thanks Tineka, I think that is now my favourite pizza topping. Dissolve the sugar in ¼ cup of the warm water and then add the yeast. Put aside to ferment – about 5 minutes. Process the flour and oil for a few seconds until it becomes crumbly. Add the yeast mixture and process. Slowly pour in the remaining ¾ cup water. Process until a dough ball forms. Continue processing for 30 seconds. 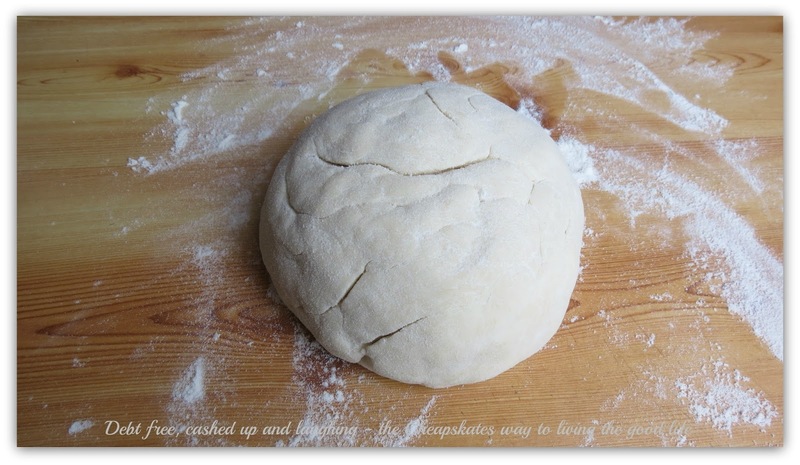 Turn the dough out onto a floured board, cover with a damp tea towel and let it sit for 10 minutes. At this point you can freeze the dough in a ball to use later on or cover with a damp tea towel and let it sit for 10 minutes before dividing in two and either pressing into a Swiss roll tin, using the palm of your hand, or pressing it into a more traditional round. 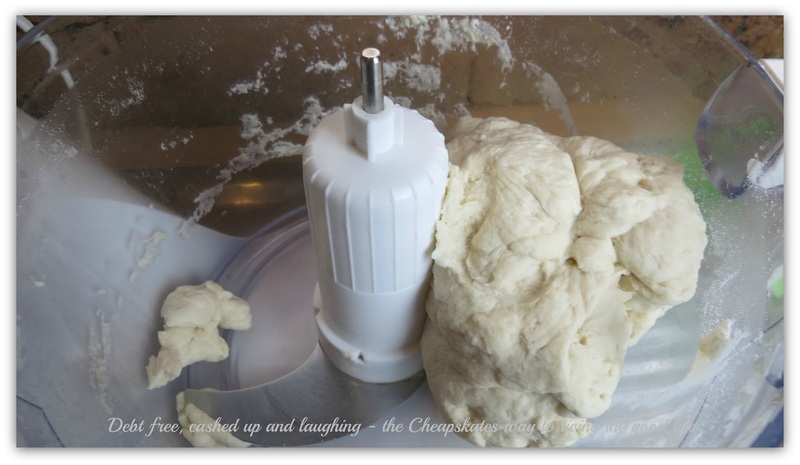 Try not to roll it with a rolling pin (or Marmite jar) as it toughens the dough. So do you think you need to spend $140 on a pizza maker? Do you MOO your pizzas? What's your favourite pizza topping?